According to the latest Employment Situation Summary from the Bureau of Labor Statistics, average nominal hourly earnings for all employees on private nonfarm payrolls rose at a compound annual rate of 3.6 percent in May 2016. That rate is well above the 2.6 percent average for the preceding 12 months, and also above the average CPI inflation rate of 2.5 percent for the same period. Monthly observations are shown by the dotted lines in the chart, while the solid lines show 12-month moving averages. Monthly data include a lot of statistical noise and are subject to revisions, so policymakers will be paying more attention to trends than to individual data points. 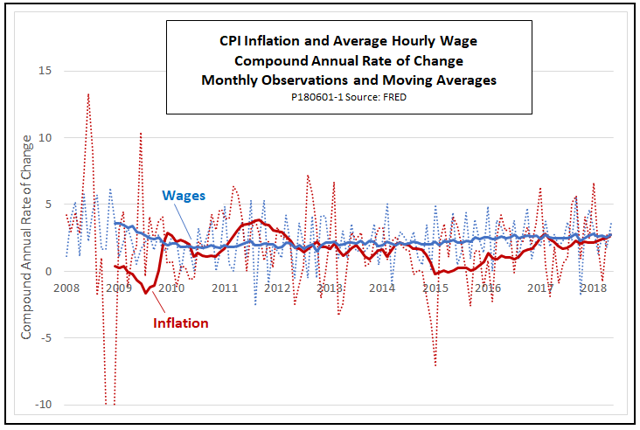 The trend lines show that over the past three years, CPI inflation has accelerated more rapidly than has the rate of nominal wage gains. CPI data for May will not be released until June 12, but by April, the last month for which full data are available, the 12-month moving average for wages exceeded that for inflation by just 0.1 percent (2.6 percent vs. 2.5 percent). The trends of the moving averages contain both not-so-good news and better news. For workers, the news is not so good, inasmuch as the wage gains for May, which are hopeful taken in isolation, may turn out to be a statistical fluke. From a macroeconomic point of view, however, the news is better. With CPI and wage trends still holding at or close to 2.5 percent, there is little sign of overheating yet.